Genea-Musings: Treasure Chest Tuesday - 1852 Marriage of John C. Paul and Maria T. Beamish in New Bedford, Mass. Treasure Chest Tuesday - 1852 Marriage of John C. Paul and Maria T. Beamish in New Bedford, Mass. 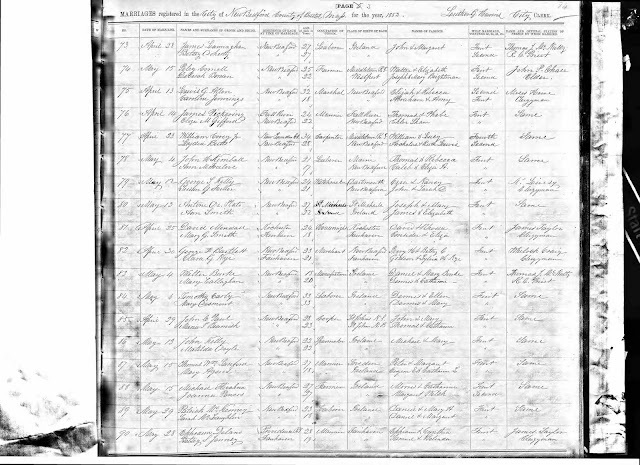 "Massachusetts Vital Records, 1841-1915," indexed database and digital images, New England Historic Genealogical Society, American Ancestors (http://www.AmericanAncestors.org), Marriages: Volume 60, Page 84, Bristol county, New Bedford, 1852, John C. Paul and Maria T. Beamish entry. 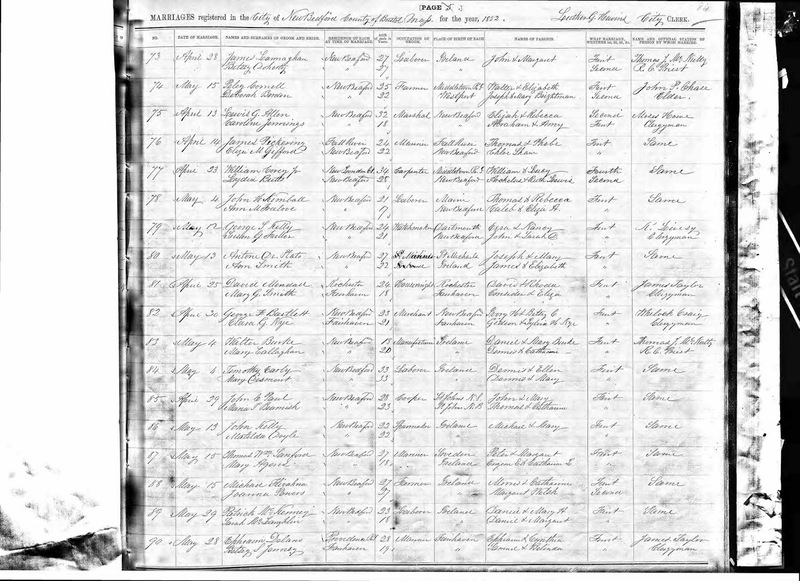 This is the only record I have that provides the names of John Charles Paul's (1823-1879) and Maria T. Beamish's (1828-1909) parents. John and Maria (Beamish) Paul are Linda's second great-grandparents through their daughter, Mary Ann Paul (1854-1908) who married Herman Schaffner (1851-1921) in about 1876 and resided in San Francisco. It is possible that John and/or Maria were born in New Brunswick, Nova Scotia or Newfoundland. Other records provide different birthplaces than the ones above. This is the earliest record I have for them, and the only one that defines a town. Their parents were probably born in Ireland.